Make learning more fun in English and Spanish! Skill-building card games and activities feature a bilingual format that's perfect for second language students. 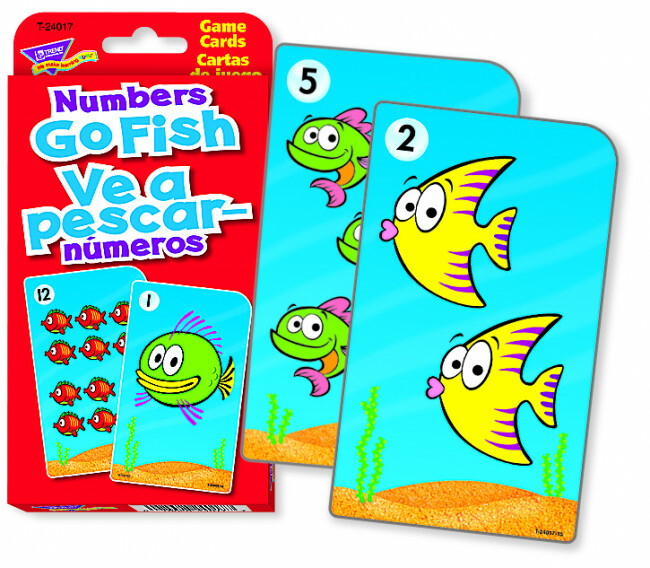 Make it fun to build counting skills as you match cards from each other and the fishing hole. Aim: To use all the cards in your hand to make “books”. Four matching cards make a book. For an easier game, collect two matching cards instead of four. Either remove the Silly Shark cards from the deck or keep them to use as a wild cad substitute for any card in a book. Only one Silly Shark cards may be used per book. Select a player to shuffle and deal the cards. For three players, deal seven cards to each. For four or more players, deal five cards to each. Spread the rest of the cards face down in the centre. This is the fishing hole. Make sure to hold your cards carefully, so other players cannot see them. The player on the dealer's left goes first. On your turn decide what cards you need to make a book. Ask one other player for the cards you want (e.g. “Do you have any threes?”). If the player has one or more of the card asked for, he or she gives the card(s) to you. You may then ask any one player for another card you need. Your turn continues as long as you keep getting cards from other players. When you get enough cards to make a book, you place the book face up in front of you. If you as for a card and the player does not have it, the other player says “Go Fish”. Then you pick a card from the fishing hole to add to your hand. Your turn is over. Play continues to the left, with all players taking turns as described in number 5. The first person to play all of her or his cards is the winner. If two players run out of cards at the same time, the one with the most books is the winner. Silly Shark Old Maid. Take out one of the Silly Shark cards, the other Silly Shark will be the Old Maid. Try to make the most pairs and try not the be left with the Silly Shark. Shuffle and deal all of the cards to the players. Players start by placing any pairs in their hands down in front of them. The player on the dealer's left goes first by picking one card from another player's hand without looking. If the card makes a pair with one already in the player's hand, the pair can be laid down. If the card chosen does not make a pair, the card goes into the player's hand. Play continues to the left, until all the pairs have been made and one player is left holding the Silly Shark. Determine the winner by scoring one point for each pair and taking two points away from the person with the Silly Shark. Memory Matching. Remove the Silly Shark Cards from the deck before playing this game. Decide if you wish to take out two of each number card so that only one pair of each is left in the deck. Try to collect as many pairs as you can. Shuffle the cards and lay them face down in a rectangular pattern. The youngest player goes first and turns over any tow cards. If the cards turned over match, the player picks them up and keeps them, and takes another turn. If the cards don't match, the player turns them face down in their original positions and the player's turn is finished. The next player turns over any card. If it matches a card already seen, he or she tries to remember where it was to turn it over and make a match, the proceeds as noted above. Players take turns turning over cards and trying to make pairs. A turn lasts as long as a player can continue to make pairs. When all the cards have been picked up, the game is over. The player with the most pairs is the winner.